The concept of the “the Comfort and Climate Box”, an integrated heating and/or cooling unit, is one of the noteworthy ideas that originated from the discussions at the first workshop for Mission Innovation Challenge 7, Affordable Heating and Cooling of Buildings. Conceptually the “the Comfort and Climate Box” is equivalent to the Turing Machine for computing; taking multiple inputs of energy sources and using these and storage to meet heating, cooling and power demands in the most optimal way (be that lowest carbon, lowest cost or lowest impact on the electricity grid). The concept integrates the findings of the Challenge priority areas into the definition of a common and identifiable deliverable. The further development of this idea is being discussed with representatives of the relevant IEA’s Technology Collaboration Programmes. The IC#7 workshop was held in Abu Dhabi on 1st and 2nd November 2017. The Priority Area Leads from the United Arab Emirates, the United Kingdom, the European Commission, India, Sweden and Australia presented the main findings of the preparatory work on each area during the plenary sessions and stimulated the discussion among the participants during the dedicated parallel sessions. Participants at the first workshop for Mission Innovation Challenge 7 in Abu Dhabi on 1st and 2nd November 2017. Over two days, the participants discussed, prioritised, challenged and developed inspiring ideas through the collective expertise in the room from 13 Mission Innovation Members, the Rocky Mountain Institute and the International Renewable Energy Agency (IRENA). 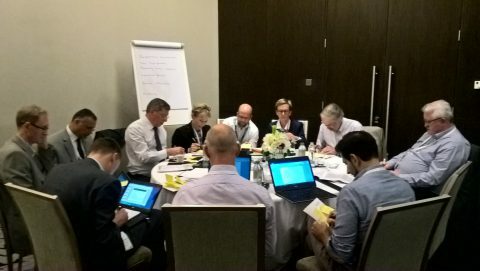 The workshop developed a number of collaboration plans, from four of the International Energy Agency (IEA) Technology Cooperation Platforms (TCP) planning to work together, to a concept for a fully integrated, low carbon heating and cooling unit and an open data platform for buildings. The interactive workshop covered all six priority areas identified under this Innovation Challenge, related to affordable heating and cooling of buildings, that is: Thermal Energy Storage, Heat Pumps, Non-atmospheric Heat Sinks and Sources, Predictive Maintenance and Optimisation, Building Level Integration and Physiological Studies for Thermal Comfort. The first round of discussion focused on the metrics and targets to be achieved by 2030 to accelerate the delivery of affordable and low carbon heating and cooling in buildings. Enablers and challenges for each of the targets were discussed in the second round, as well as related key performance indicators that should be set to track the progress of the priority areas within the Heating and Cooling Innovation Challenge. 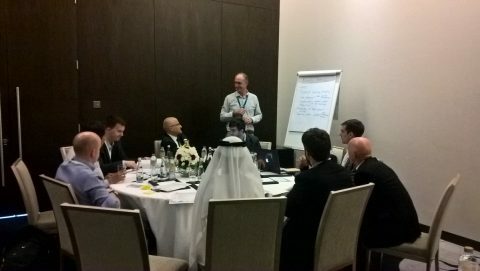 Developing and prioritising ideas at the Mission Innovation Challenge 7 workshop in Abu Dhabi. On the second day, research priorities to achieve the targets were identified. In the Building Level Integration priority area, which connects all other priority areas of this Challenge, discussions also covered the identification of cross cutting issues, including: big and open data platform & build and operational standards; dynamic controls; non-air-conditioned buildings; heat system integration/ prosumer networks; and non-technological issues. The full Workshop proceedings presenting the technical findings and feedback from the workshop can be found here. The Workshop Summary sets out the challenges and identified action areas. The conclusion of the workshop was that there is great potential for technological advancements in the heating and cooling of buildings sector and that greater innovation is required to achieve higher energy efficiency and lower carbon emissions. The Innovation Challenge Priority Areas leads from the United Arab Emirate, the United Kingdom, the European Commission, India, Sweden and Australia will continue the common effort to accelerate progress of technological solutions with concrete market application potential. Participation of other Mission Innovation members in the activities of the Affordable Heating and Cooling of Buildings Innovation Challenge is welcomed. For more information please contact the Mission Innovation Secretariat Support team.